ONE WORLDcitizens (OWC) would like to invite you / your organization to the upcoming Global Goals Hub Eindhoven on Friday the 22nd of February 2019 from 10:30 to 17:00 o’clock @ Seats2Meet Strijp-S in Eindhoven. In the attachment you can find the invitation with more information about the program. You’re welcome to share this invitation with your professional and personal network. 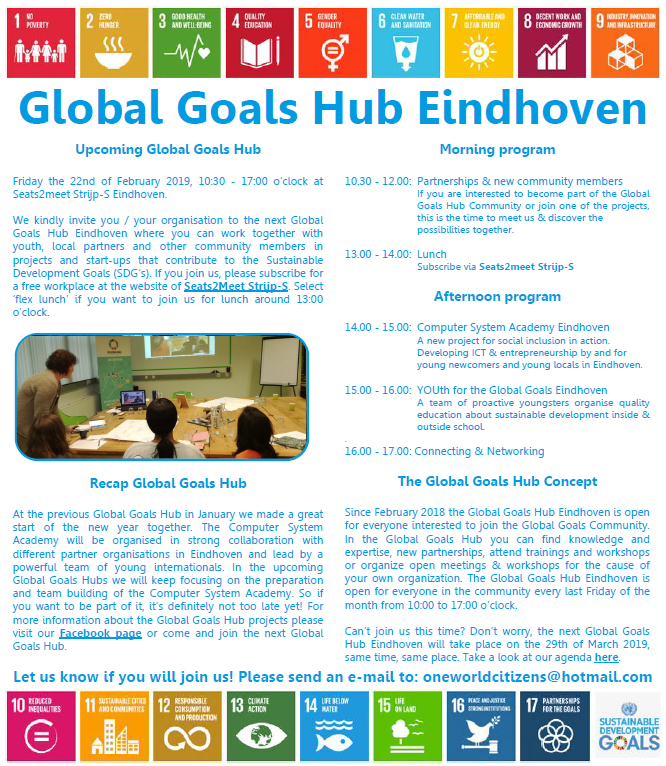 We hope to see you all at the next Global Goals Hub Eindhoven. Please let us know if you join us! Can’t join us this time? Don’t worry, our next Global Goals Hub will take place on Friday the 29th of March 2019, same time, same place. Take a look at our Facebookevent for more upcoming dates.